Common size: 2-6 inches. Approximate Maximum Size ~ 7 inches. Food Habits: Threadfin shad are filter feeders consuming microscopic plants and animals, including larval fish. Spawning: Threadfin shad spawn in shallow shoreline areas during May and June. The adhesive eggs are released and attach to various substrates until hatched. Miscellaneous: The threadfin shad is closely related to gizzard shad, but does not grow as large and is more temperature sensitive. It is considered by most fishery managers to be the single most important prey fish in North Carolinas reservoirs. 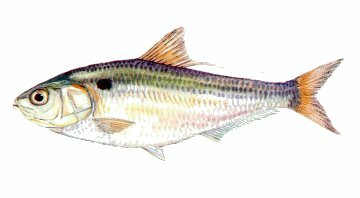 Although the threadfin shad occurs in nearly all waters, they are most productive in large impoundments. Threadfins rarely exceed 5 inches making them an ideal size food item for all predators. Threadfin shad are a temperate species and moralities occur throughout the state when winter water temperatures drop below 43°F. Fishermen often capitalize on these events by vertically jigging spoons that imitate stressed and dieing shad. Threadfin shad can be captured by cast nets and used for bait. However, they are fragile and require special bait tanks to keep them alive.